If you haven’t already got Extra Virgin Organic Coconut Oil in your life…. time to go stock up on some! No healthy foodie cupboard is complete without this sensational super versatile superfood. 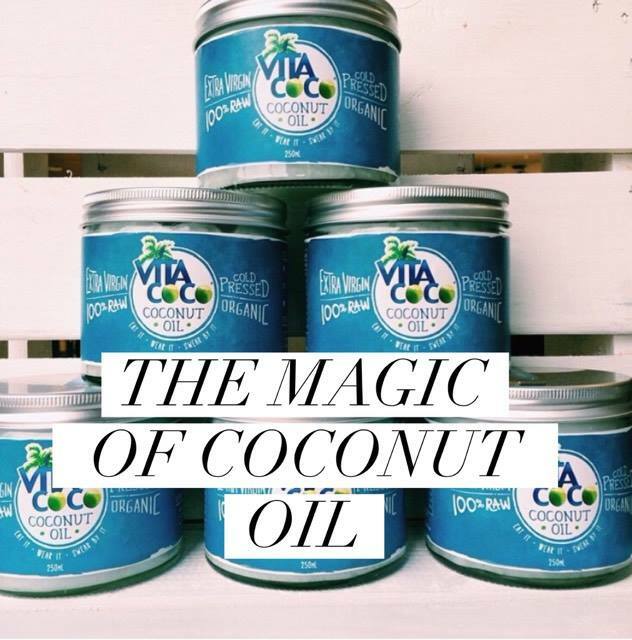 So most people know you can cook with coconut oil….but I bet you didn’t know you could rub it into your face, hair and body for extra natural health & beauty benefits!? I swear by the stuff for just about anything really. Here are my top 5 uses for the magical oil, read on if you want to know more about how you can get the most from your coconut oil. Coconut oil has been described as the world’s most weight loss friendly fat.I stirfry all my meats in coconut oil to add extra fat-burning potential to my meals. “How does eating fat help you burn fat?” I hear you say! Well, Coconut oil is high in Medium Chain Triglycerides, which are fatty acids that are metabolized differently than most other fats, leading to a boost in metabolism. Several studies show that just by adding coconut oil to your diet, you can lose fat!!! Studies have shown that medium chain triglycerides can boost metabolism, in one study increasing calorie burn by 120 calories per day. If thats not enough to convince you you need coconut oil in your life, read on for more persuasion. Coconut oil is used in tons of natural beauty products. It is naturally anti-bacterial and anti-fungal and is an excellent moisturiser for dry skin. Rubbing a little coconut oil into dry patches on your face or body just before bed can really help get your skin looking hydrated and smooth again. Its great for elbow skin too, where people naturally get rough dry patches! If you are on your feet a lot or have hard, patchy skin on your feet, slather your feet in oil (or use this as an excuse for a cheeky foot massage off your partner lol!) and pop some old socks on. In the morning VOILA! Silky soft feet. And the added bonus….it smells AMAZING too, and so will you! So, apparently that big top baby brand is actually BAD for babies skin….. (not naming names but itbegins with ‘J’. My midwives and health visitors have totally scared me off using the stuff. Apparently the products have been linked to cancerous cysts. First of all I started researching some ‘top of the range’ natural organic baby products. Then I stopped, and realised I had something in my cupboard all along that would do the trick, at no extra cost! We use coconut oil for dry skin on adults, why not on babies too? It works a treat. Scrape out a chunk of the oil and warm between your palms until melted. Combine with a gentle baby massage and your little one will be in baby heaven! As a queen of clean baking (hehe! ), coconut oil is a staple in my store cupboard. The majority of people actually have an underlying dairy intolerance which causes some inflammation in the body (think water retention and holding a few extra lbs!). So cutting dairy out and replacing butter with coconut oil can help your body immensely when trying to improve your health. Eating coconut oil also has the added bonus of helping our bodies to burn fat (see above!). SO you can enjoy treats knowing they are super healthy for you and helping with fat burning and boosting your metabolism too. Result! If you suffer with dry, brittle hair, a deep coconut oil condition can be a god send! You don’t need to buy expensive organic treatments when you have this little pot of wonders at home. Apply a dollop to your hair, comb it, and then pile it into a loose bun. You’ll want to place a soft towel over your pillow or sleep in a shower cap. In the morning, shampoo as usual with a gentle cleanser. If you enjoyed this article join me FREE online community for daily health and wellness tips over on Facebook by clicking HERE.